THIS WINTER IN THE U.S. & CANADA . . .
Folks sometimes ask us how we are able to find something to write about for each new installment of "This Week at Hilton Pond," and our honest answer is we simply go outside with eyes open and camera in hand. Although Hilton Pond Center is a "mere 11 acres," there is so much nature activity on it we could never run out of subjects to investigate and discuss. The same can be said of even smaller properties in suburban and rural settings, which is why we always encourage people to explore what's in their own backyards. Often as we walk the trails at Hilton Pond we see a familiar organism but look at it from a different perspective, while other times we see something we've never encountered here or elsewhere. The latter happened this week when we stumbled across a "new" four-foot-tall shrub with bright red berries, growing less than 25 yards from the front door of our old farmhouse. Based on its fruit and leaf configuration we thought we knew in general what was, but it took us a while to identify it to species. We had mixed feelings when we found out it was Amur Honeysuckle, Lonicera maackii. One reason we didn't recognize this particular shrub is because it's non-native and we're not so adept with exotic horticultural species. However, those who have intimate acquaintance with Amur Honeysuckle are probably saying, "Oh, no, not ANOTHER invasive species wreaking havoc at Hilton Pond" while imploring us to "Destroy it immediately!" Although native bush honeysuckles occur naturally in the northeastern U.S., others brought in as ornamentals have escaped cultivation across the country-- sometimes to the detriment of native plants and habitats--and that seems to be the case with Amur Honeysuckle. All other bush honeysuckles you're likely to encounter in the Carolinas are undoubtedly non-natives, including the Amur Honeysuckle we found this week at Hilton Pond. Although we didn't know its species, we suspected the shrub was a member of the Honeysuckle Family (Caprifoliaceae). 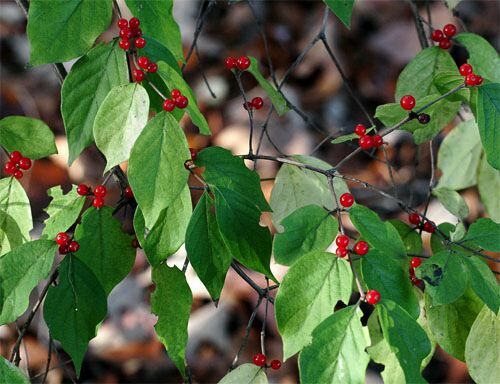 The first clue to classification was that the bright red quarter-inch berries were shaped much like those on Japanese Honeysuckle, whose fruits are blue-black. We also noticed that all the shrub's twigs and oval, somewhat-pointed, three-inch leaves were opposite. 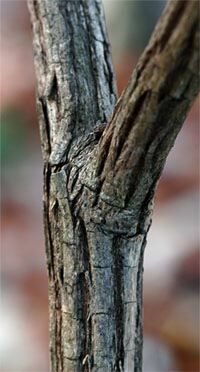 Younger twigs were pubescent, while foliage fuzz was limited to the leaf margins and main veins on leaf undersides. We also looked at older stems and their grayish-brown bark (right), which was deeply furrowed but not particularly stringy. 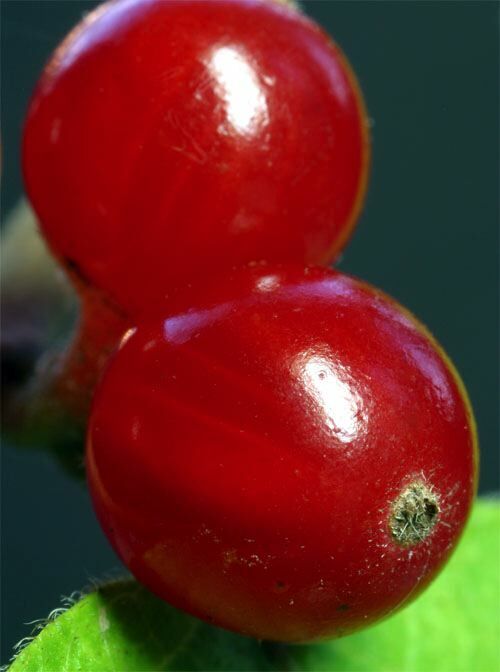 Other than the brilliant color of the fruit, however, what really struck us was the shrub's berries appeared to be in groups of four (above), two springing from the axils of each pair of opposite leaves. In about 1855, Amur Honeysuckle was imported from east Asia to New England as an ornamental; its name comes from the Amur River, which forms the border between Russia and Manchuria. 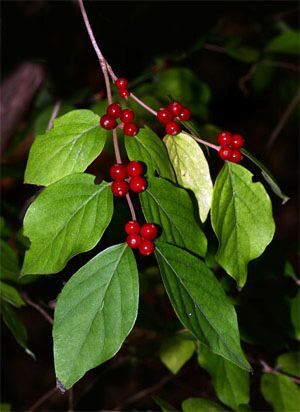 A fast-growing shrub, it thrives in sunlight and shade, poor soil and rich, and in the past 150 years has spread throughout the northeastern U.S. and west to Kansas; it is relatively uncommon in the Carolinas but seems to have gotten a roothold in Georgia. In some locations this bush honeysuckle forms dense thickets and reaches heights of 12 feet. Its dispersal is facilitated by highly visible berries eaten by hungry birds that fly off and deposit seeds elsewhere. 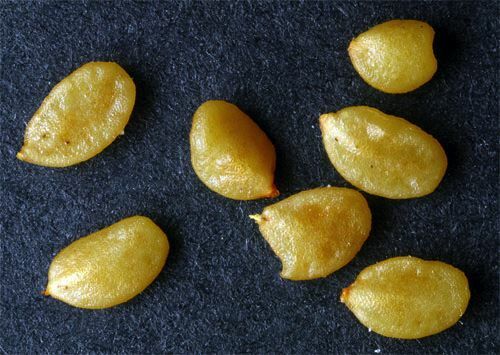 When we cut open berries from our Amur Honeysuckle, we found up to seven irregularly shaped yellow seeds within each (above). 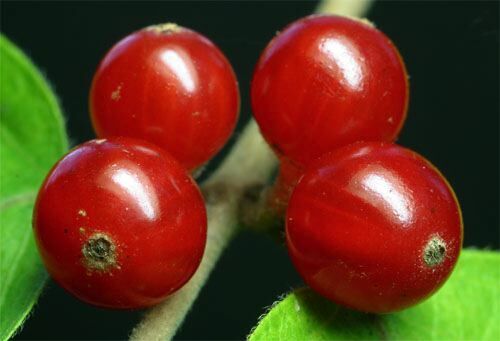 Since even a small bird could consume several berries at one sitting, it's easy to see how just one shrub with hundreds of fruits has potential to propagate itself far and wide. Berries are especially visible against the light-green foliage of Amur Honeysuckle--one of the last plants to drop its leaves in autumn. Amur Honeysuckle is also one of the first shrubs to leaf out and bloom in spring. Although we've not seen the plant in flower, we learned its blossoms occur in quartets (below)--hence the four-berry configuration that first caught our attention on the shrub at Hilton Pond Center. 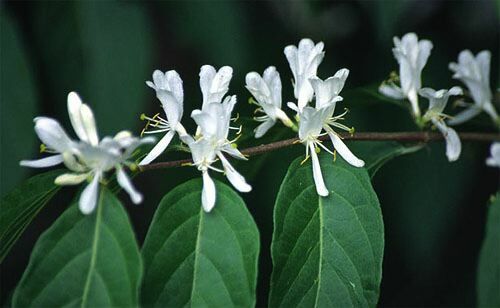 As expected, the five-parted flowers resemble those on the more-familiar Japanese Honeysuckle vine--even to the point of starting out white and turning pale yellow as they age. One might ask how a conspicuous four-foot-tall flowering shrub with snowy white blossoms and bright red berries could have escaped our attention during our 25 years on the property. For one, we don't think the Amur Honeysuckle has been here that long; it could have been planted more recently by a bird, or it may have sprung from berries mixed in bags of leaves we once collected from curbside in downtown York and scattered at the Center. However, the most likely reason we'd never noticed this particular shrub is because it's on part of the property we seldom explore--a wooded buffer between our old farmhouse and the main road. We spend most of our time on the other 10.75 acres, walking trails and intentionally staying away from traffic noise emanating from the highway. 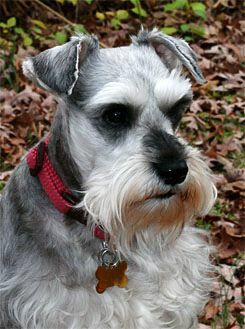 The only reason we even came across the Amur Honeysuckle this week is because we've been doggy-sitting a pedigreed Miniature Schnauzer while younger son Garry has been moving. Gabrian (above left) is a city dog entranced by the wonders of country living, so he's always excited and rambunctious when he goes outside for a potty run. It was only when we followed Gabe into a little-traveled section of our front woods that we saw the Amur Honeysuckle's berries glistening in the afternoon sun. Now that we know we have Amur Honeysuckle on the property, we're in a quandary. There's no question this non-native shrub has potential to become invasive, but we can't deny its foliage and berries are very pleasing to the eye and a nice complement to the visual landscape. This is the very problem that has arisen from the importation of many attractive horticultural plants: They look great, grow fast, reproduce prolifically, and often become environmental pests. If we were absolute purists, we'd be out this afternoon whacking down the Amur Honeysuckle and digging up its roots, but then we'd have to eradicate our Daffodils and Tulips and Forsythias and Irises and Daylilies and who knows what else foreign that might be growing at Hilton Pond Center. For the moment, we want to observe the Amur Honeysuckle a little more, imprinting its characteristics on our memory so we'll recognize it next time we see it elsewhere. But don't be surprised on your next visit if we're unable to show you local examples of this non-native shrub with brilliant red berries. --A Great Blue Heron (above) that has taken up residence at Hilton Pond Center spends at least a few hours each day foraging along the banks--or sometimes just basking in the warm afternoon sun. Once or twice a week this tall, stately wader is joined briefly by a dazzling white bird of almost-equal size--a Great Egret with yellow bill and black legs. Although the heron may have hatched at one of the Catawba River rookeries within ten miles or so of Hilton Pond, the egret has wandered far inland from its breeding grounds--probably along the Carolina coast. The heron has grown accustomed to our presence and seldom flies unless we get too close, but the egret is easily spooked and eludes all our attempts at photography.